Apart from the ‘coastal dimension’ and thus the obvious linkage to ICZM processes and the notion of (cultural) marine landscapes; the topic of land-sea interactions is also highly related to the economic impacts of MSPs and the importance of given maritime uses covered by the MSPs for the economic development of the region / country in question. The topic is therefore closely linked to the topic MSP Strategies and MSP for Blue Growth. Land-sea interaction (LSI) has been the topic of a study commissioned by DG ENV, titled 'Land-Sea Interactions in Maritime Spatial Planning'. The brochure is available for download below and more information about DG ENV and their work on LSI can be found here. Most of the publicly available practices dealing with land-sea interaction are actually outlined in projects or underlying studies rather than the actual plans. The great majority of practices show how data and information resources as well as planning frameworks should / could be better aligned in order to achieve the integration of terrestrial with marine spatial planning. The focus is often on coastal regions; hardly any examples exists which deal with the issues far away from the sea, such as the connections between land-sea traffic, ocean energy production flows or agricultural applications. Most development and activities taking place in the marine environment also have an onshore component or implication. Alignment between marine and terrestrial planning is important and should be achieved through consistency of policy guidance, plans and decisions. In some Member States, MSPs are – by principle - integrated in territorial spatial planning as they form part of the general land use plans (i.e. Lithuanian Master Plan / German Federal Plan of Mecklenburg-Vorpommern). The EU MSP Platform organized a conference on this topic for the European Commission in June 2017. National experts and MSP practitioners exchanged experiences and knowledge during three interactive sessions focusing on key LSI issues in specific countries / contexts, strengths and weaknesses of sub-national approaches to LSI and the LSI issues faced by participants. All documents from the conference, including the conference briefing paper, summary report, and presentations, can be found on the event page. The Directorate General for Environment has published a study in 2017 titled 'Land-Sea Interactions in Maritime Spatial Planning', which explores the relationship between the Directive on Maritime Spatial Planning and LSI, as well as the relationship between LSI and Integrated Coastal Zone Management. The report describes the LSI of eight of the most typical marine development sectors, along with the key messages and issues to be considered in the MSP process. The report is available for download here. Further exploration of the topic is the subject of the currently ongoing ESPON project on MSP and LSI. Is MSP only about planning of sea areas or does it refer to a broader geographic context? According to the DIRECTIVE 2014/89/EU establishing a framework for maritime spatial planning, whilst it is noted that activities carried out on land such as agriculture and urban growth can have a profound impact on the marine environment for example via run off of chemicals / waste etc. and as such are relevant in the context of Maritime Spatial Planning, MSP directive manages only maritime activities and activities in coastal waters. It is noted that achieving consistency between maritime and terrestrial will be challenging and that in order to “promote the sustainable use of maritime space, maritime spatial planning should take into account land-sea interactions”. What is the difference between integrated coastal management (ICM) and MSP processes? ICM can be defined as dynamic, multi-disciplinary and iterative process to promote the sustainable management of coastal zones (EC COM(2000) 547). The 2002 Recommendation sets out broad principles for ICM processes, including the need for informed participation and co-operation of all stakeholders. The same Recommendation (and the following EC COM(2013) 133) invites Member States to develop ICM strategies based on the results of a previous stocktaking of major actors, laws and institutions influencing coastal management. Indeed, there is no EU requirement for all Member States to conduct ICM, and practice varies according to local conditions. However, for the Mediterranean basin the ICZM Protocol to the Barcelona Convention defines a common binding framework for ICM. MSP, by contrast, is a formal requirement for all EU Member States and mounts into maritime spatial plans. It is worth mentioning that the geographic scope of the ICZM Protocol in the Mediterranean extends seaward to the external limit of the territorial sea of the Parties, overlapping with the MSP area of interest. How can be MSP used to integrate various already existing planning approaches like ICM or EBM (Ecosystem-based management)? What examples of plans or guidelines exist which can provide a framework for integrating terrestrial and marine planning? 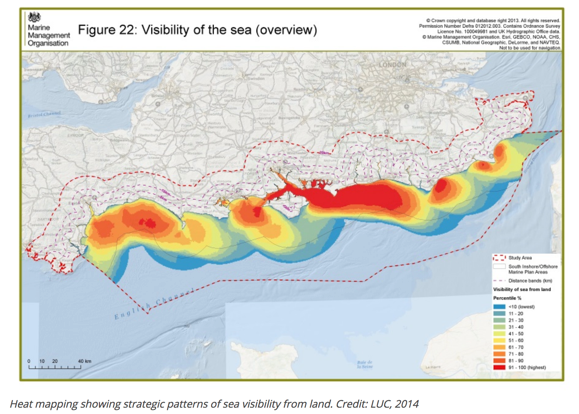 The Interreg funded C-Scope project was undertaken by the Dorset Coastal Form (DCS) and the Coordination Centre on Integrated Coastal Zone Management in Belgium. One of the key aims of the project was to develop a framework for an integrated approach to land and sea planning and management which also provided practical case studies, comprehensive information resources and test cases for the implementation of MSP in both partner areas. In the Kattegat and Skagerrak the Hav möter Land (Land meets Sea) project brought together 26 municipalities, regions, universities and governmental organisations from Norway, Sweden and Denmark one major aim being working to achieve coordinated management of the land and sea. In addition a number of examples of guidelines have been produced to encourage local authorities and other regulatory bodies to consider how land use planning and marine planning are interlinked. For example in the UK, the Marine Management Organisation produced a Guide for Local Councils which compared land use and marine planning in order to improve understanding of the links between the two. These and a number of other practice examples can be found on the practices section of this website. In addition to these practices a briefing paper was produced prior to the LSI Conference in Malta which outlines the complex dynamics which exist between land-sea interactions along with the various options for governance which have been used to address this. The diagram below summarises this framework. 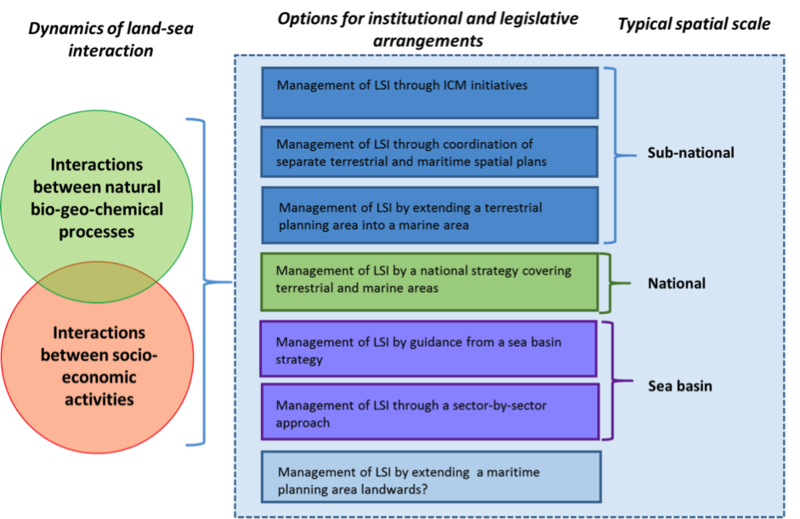 In 2018 the European Commission Directorate-General for Environment produced a brochure entitled “Land Sea Interactions in Maritime Spatial Planning” designed to give an understanding of how LSI can be addressed in the development of maritime spatial plans for 8 key sectors. The eight most typical marine sectors described in the report are: Aquaculture, Desalination, Fisheries, Marine cables & pipelines, Minerals & mining, Ports & Shipping, Tourism & coastal recreation and Offshore Energy. More detail can be found in the Practice description 'Land-Sea Interactions in MSP'. What are European approaches to coastal landscape and seascape protection? There is high appreciation and public interest in coastal landscapes and seascapes, leading to a desired to preserve them as they are. Landscape is understood to be not just a “scenery” because it links culture with nature and the past with the present. The EU Landscape Convention (ELC) is the first international convention to focus specifically on landscape. ELC sees “landscape” as “an area, perceived by people, whose character is the result of the action and interaction of natural and / or human factors” (Council of Europe, 2000). This includes land, inland water and marine areas. The convention foresees actions to identify and assess landscapes and, most important in this context, requires the integration of landscape into planning policies, including underwater landscapes and their cultural heritage like ship wrecks (please see the FAQ on Marine Cultural Heritage for more on these topics). For example, in Finland, new approaches related to underwater landscapes are emerging. ELC can be seen as a key driver behind the Member States approach, with 39 countries having already signed the convention, to take all aspects of a landscape into account when protecting, managing and planning it. Additionally, as defined by the ELC, the term “seascape” is “an area of sea, coastline and land, as perceived by people.” With the advent of major maritime economies activities that are very large in scale, coastal landscapes and seascapes may in some cases be affected and thus visible from shore. As a defined spatial element of conservation, in the Habitats and Birds Directive (92/43/EEC, adopted 1992) much emphasis is placed on the primary pillar, i.e. designation and inclusion of MPAs in planning processes in order to achieve conservation objectives. In most cases, MPAs have already been designated and are therefore incorporated into the MSP process when allocating areas for other activities (for example in Germany). Their status would not be expected to change through MSP, and the objectives of the MPA will be a consideration in planning activities which may interact with the site or its’ conservation features. Where MPAs are required, MSP can support their designation and understanding of objectives in relation to other interests. Please see the FAQ on Nature Conservation for more discussion on MPAs. When protecting European coastal landscapes and seascapes, also the international IUCN Protected Area Categories are important. They classify protected areas according to their management objectives and range from “Strict Nature Reserves” (Category Ia) to “Protected area with sustainable use of natural resources” (Category VI). Also a category V “Protected Landscape/Seascape” is foreseen where interaction of people and nature over time has produced an area of distinct character with significant ecological, biological, cultural and scenic value. However, so far only a few examples outside the EU applied the category in coastal and marine settings. Instead, in Europe, protected areas range from national parks, nature parks to biosphere reserves. The latter provides the unique opportunity to preserve cultural landscapes and to allow sustainable use in parallel to strong protection according to the UNESCO programme “Man and biosphere” from 1970. An example for a biosphere, which protects on 22.000 ha all types of landscapes and coasts of the German Baltic Sea is the biosphere South-East Rügen. In the C-Scope project a seamless coastal and marine planning framework was created to suit the demands of professional and non-professional users. Inter alia the Coastal Atlas was upgraded to a Coastal Explorer to have an interactive and dynamic planning tool to support decision-making on the coast. In the Baltic Sea Region, there are HELCOM-VASAB "Common Recommendations for Spatial Planning of the Coastal Zone in the Baltic Sea Region", and the Balance project developed a sophisticated approach to mapping marine landscapes. On the national level, Germany’s Mecklenburg-Vorpommern's marine plan has so-called reservation areas for tourism. These are defined as "areas of sea where, depending on the elevation of the outer coastline (height above sea level), vertical structures could interrupt the uninterrupted view of the scenic landscape". Essentially, this excludes large parts of the territorial sea from offshore wind farming for aesthetic seascape reasons. The argument is that the seascape has special scenic qualities that are important for tourism, so the plan seeks to ensure (where possible, and bearing in mind the visibility of vertical structures) a mostly natural looking seascape, looking from land to sea and vice versa. In Poland, wind farms are not allowed in the territorial waters at all, in order not to disturb tourism developments. The Scottish government has published several guidelines that consider the concept of coastal landscapes, including ‘Guidelines on the Environmental Impacts of Wind Farms and Small Scale Hydroelectric Schemes’ and the ‘Guidance on Siting and Designing Wind Farms’ (2001, 2009, 2014). The latter was obligational for offshore wind farm planners and landscape assessors alongside the document ‘Offshore Renewables –guidance on assessing the impact on coastal landscape and seascape’ (2012). With the adoption of the Marine and Coastal Access Act 2009 for England and Wales, the concept of ‘seascape’ was formally defined. This legislative requirement further stimulated the production of Seascape Character Assessments across the UK. In the framework of these assessments, an innovative method of mapping land-sea and sea-land visibility has been developed (see figure below.) An example of a seascape assessments are available for England's South Marine Plan, Northern Ireland and Wales. In the Welsh example, 29 ‘marine character areas’ assessments, were developed to identify the ‘character’ of Wales’ seascapes. These assessments have been taken into consideration into the Wales National Marine Plan. Development and application of a process for assessing the seascape character of distinct coastal and marine areas around Wales. The project provides a comprehensive planning and information resource to underpin sustainable coastal management at a local level. The website also has general reports on overall results of the project. This report presents the final results of an Applied Research Project conducted within theframework of the ESPON 2013 Programme. This is the first time that ESPON has explicitly looked to the seas as part of European space and not simply as an adjunct to the land or as a barrier to territorial development. The practice within the ALBORAN project illustrates a way to guarantee the sustainability of the results and the continuity of the initiatives and pilot projects undertaking during the ALBORAN project. Following a participatory approach and taken into consideration a SWOT analysis, a number of initiatives were identified and put together into a document. ARTWEI focuses on transitional waters and aims to strike an operational balance between EU requirements for Maritime Spatial Planning framework, Water Framework Directive and Integrated Coastal Zone Management, which do often overlap or contradict each other. A range of reports on stakeholder engagement activities, including reports on the annual coastal forum for Belgium; For Dorset a web-based interactive tool was developed, called "iCoast". It has information on 26 different watersport and coastal activities in Dorset.